View More In Storage & Organization - Page 5. Your cereal consumption is borderline obsessive. When 9 p.m. strikes, you blankly stare into your pantry, wondering which box of flaky or fruity goodness you will pour yourself tonight. 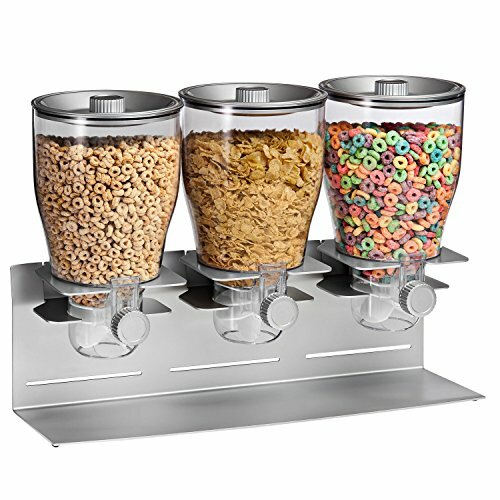 See your options a little more clearly with this Triple Canister Dry Food Cereal Dispenser crafted from commercial grade stainless steel. It’s a professional container that takes cereal-ing just as seriously as you do. You’ll feel at ease knowing that the soft rubber paddle wheel will handle your almond nut clusters with care as they tumble down the chute and tap dance into your bowl. A visually stunning addition to any kitchen, you can also fill them with oatmeal, granola, nuts and more distant cousins of your cereal family. If you have any questions about this product by ZevrO, contact us by completing and submitting the form below. If you are looking for a specif part number, please include it with your message.